In about 20 years, the growing use of electric vehicles could take a quarter-billion-dollar-a-year hit on a state fund relied upon to finance better roads, the Iowa Department of Transportation said Jan. 29. Iowa’s motor fuel tax revenue is falling as average fuel efficiency is increasing and as more Iowans choose electric vehicles, Iowa DOT Director of Planning, Programming and Modal Division Stuart Anderson told members of the state House Transportation Committee. For the current fiscal year, fuel taxes are expected to generate $656 million. There are about 800 battery-electric vehicles in Iowa now, Anderson said, and about 1,900 plug-in hybrid electric vehicles. The Energy Efficiency Administration projects that by 2050, electric vehicles will account for 14% of new vehicle sales. On the other hand, both Bloomberg New Energy Finance and Energy Innovation estimate about 60% of new vehicle sales will be electric models by that time. 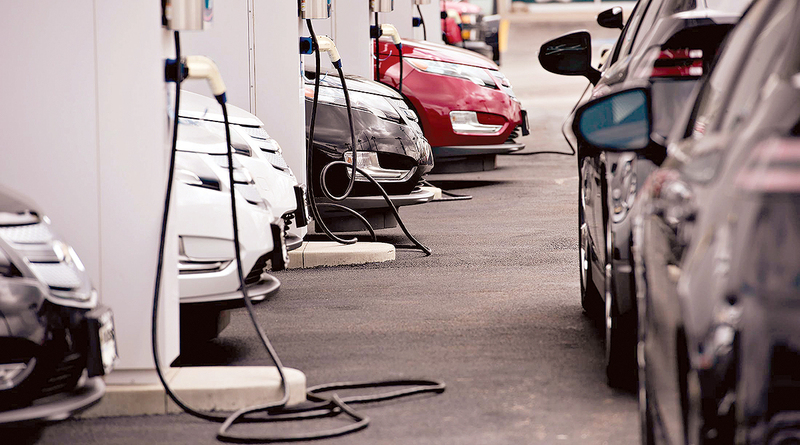 To mitigate the predicted revenue loss from the transportation fund, Iowa DOT is recommending the state add a 2.6-cent per kilowatt-hour excise tax for nonresidential charging stations. That tax would capture revenue from vehicles passing through Iowa that stop to recharge, Anderson said. In addition, to capture revenue from Iowa electric vehicle owners, the Iowa DOT is proposing a $130-per-year fee be added to battery-electric vehicle registrations; $65 a year for plug-in hybrid vehicle registrations and $9 a year for electric motorcycle registrations.